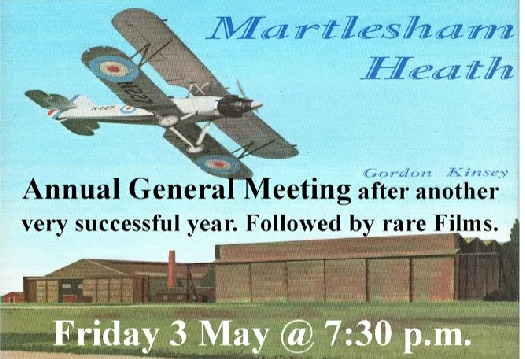 Meetings are held in the Community Hall, Felixstowe Road, Martlesham Heath. IP12 4PB on the first Friday of each month. Meetings start at 7.30pm with a tea/coffee break at half time. April 26th Ipswich Aviation Society are arranging a visit to the RAF Wittering Heritage Centre. MHAS members are welcome to join them. May 3rd. - AGM followed by a video (not yet chosen). June 7th Sally Dearman Cummins to give a talk "From Jets to Wobbly Heads". About her career in the RAF as a pilot of jets and helicopters. July 5th – Not yet finalised. August 2nd – Visit to the RAF museum at Hendon and possible the Mosquito museum at Salisbury Hall. Sept 6th. – Talk by Rich Graham. an ex Blackbird pilot SR71 pilot who flew from Mildenhall. Nov 1st Clive Stevens to give a talk, US Air Force - 1945 Legacy. Dec 6th Return of Ken Ellis. To give a talk, "The De Havilland Havilland Story”.